Anniversary Paintstrokes Cellophane Roll 24 inches wide x 50 ft long. 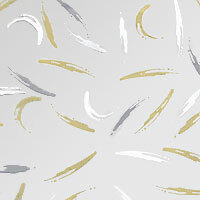 Silver, Gold and White strokes of color on a clear cello background. size	: 24" x 50 ft.
Beautiful design cello for anniversaries, weddings and showers or use as an every day precious metals design.